Save for two extra button around JOG BALL and WinMo 6.1, HTC Snap is pretty much same as beautiful and the Black berry BOLD. Don't you want? Anyways, HTC's new smartphone offering sits under a half-inch thick and is surprisingly normal looking, compared to some of their other handsets. Still, it packs in a 2.4-inch screen, 528 MHz Qualcomm processor, 192 MB RAM, MicroSD slot and 256 MB internal memory, 3G HSPA, Bluetooth 2.0, 802.11g wi-fi, 2 megapixel camera, GPS and, of course, a QWERTY keyboard. On top of that, it has a lovely 1500 mAh battery with 8.5 hours of talk time, and an estimated 15 days of standby. HTC also endowed the phone with a new Inner Circle feature, which lets you hit one button that brings emails from a pre-selected group of contacts to the top of your inbox. Basically, it's the enterprise version of T-Mobile's Fave Fives, minus creepy/annoying/brilliant ads featuring Charles Barkley and Dwayne Wade. 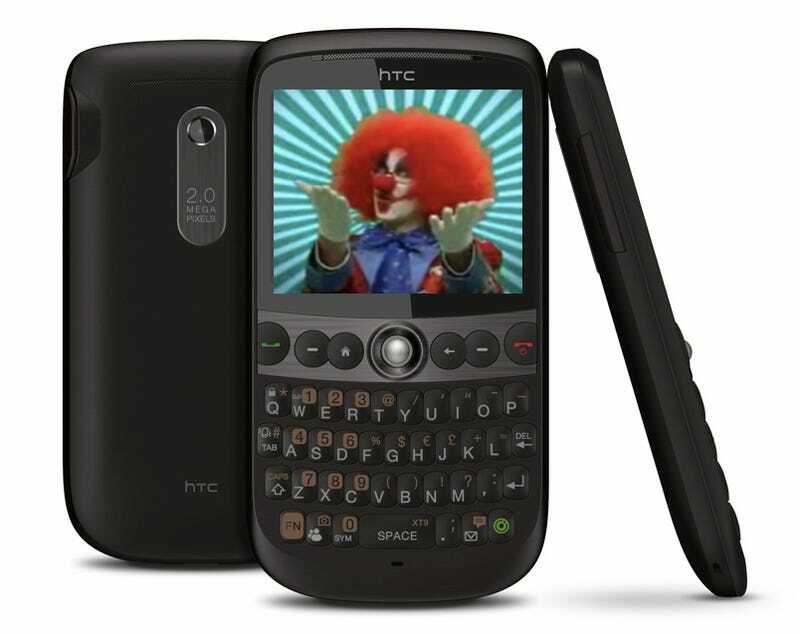 LAS VEGAS – April 1, 2009 - HTC Corporation today debuted its newest QWERTY smartphone, the HTC Snap™. Designed with a set of features selected to deliver everything customers need without overwhelming them with things they don't, the HTC Snap makes it easier than ever to stay in contact with life's most important people. A recent study conducted by Harris Interactive® and commissioned by HTC* found that 44% of US adults are often overwhelmed by the amount of email they receive, and over half (55%) of US adults prioritize five or fewer people with whom they communicate via email. In response to these issues, HTC's innovative Inner Circle feature allows HTC Snap users to press a dedicated Inner Circle key to bring emails from a preselected group of people to the top of their inbox, enabling important messages to be acted upon immediately. "Recognizing that people are being overwhelmed by an avalanche of email, the HTC Snap introduces Inner Circle, an HTC innovation that makes it easy for people to prioritize messages from the most important people in their lives at the press of a button," said John Wang, Chief Marketing Officer, HTC Corporation. "The HTC Snap represents the latest step in HTC's mission to create a range of innovative smartphones, each with specific benefits designed to both surprise and delight our customers." With a slim, sleek profile designed to fit perfectly in the hand, the HTC Snap measures less than a half-inch thick (12 mm), yet it can deliver up to eight and a half hours of talk time with the standard 1500mAh battery. The full QWERTY keyboard is ergonomically designed with extra-large domed keys and responsive tactile feedback to make typing emails and text messages fast, accurate and comfortable. High-speed 3G HSPA connectivity makes it quick and easy to send pictures to friends, access favorite social networking sites, or download large files while on the go. The HTC Snap is powerful enough for experienced business users looking for an affordable, straightforward choice for remotely synchronizing email, calendar and contacts with their Microsoft Exchange server. However, the flexible Microsoft Windows Mobile® 6.1 Standard platform allows the HTC Snap to also be simple enough for first-time smartphone users wanting to keep their family life organized. The HTC Snap is expected to be available in select channels during the second quarter of 2009, rolling out in markets around the world throughout the second half of the year. Additionally, an unlocked version supporting HSDPA at 850/1900MHz for the US market will be made available under the name HTC S522 during the summer.